Then again, this should’ve been expected by this point. Pixar cemented its status as the greatest animation creator since Walt Disney years ago and they proved they could handle sequels when “Toy Story 2″ was released 11 years ago. Rather than start directly where it last left off, “Toy Story 3″ takes place in the present day. Andy is now 18 and heading off to college. He hasn’t played with any of his toys in years. While he means to keep them stored in the attic, the toys end up being donated to a day care center by accident. What seems at first like paradise with a benevolent bunch of toys, including Lotso (Ned Beatty) and Ken (Michael Keaton), turns into a living hell for deserted toys. The mission, once again, is to get back to Andy. Despite being locked up in a chest for years, the toys haven’t changed at all. Woody (Tom Hanks) remains the most loyal friend in the world. Buzz (Tim Allen) still believes he’s a real space cadet. Jesse, Mr. and Mrs. Potato Head, Rex, Hamm, and even the little red monkeys, are all still there. And let the nostalgia begin. When the original “Toy Story” was released in 1995, it ushered in an era of computer animation. It’s incredible to see how far the genre has come since then with the characters that started it. By this point, “Toy Story 3″ doesn’t even look like it was created on a computer. It might as well have been shot on real Hollywood sets. Well, it might just look even more real than that. “Toy Story 3″ also has the benefit of 3D. That’s right, I said benefit. The only other movie I’ve seen that’s benefited from 3D is “Avatar” (the wine cork scene from “The Final Destination” doesn’t count). What works with the 3D in “Toy Story 3″ is that its not gimmicky. Nothing pops out at you. The characters and settings pop out of the screen organically. If more filmmakers could harness 3D in appropriate ways like this, then I might just hop on board. “Toy Story 3″ certainly doesn’t hide behind its visuals. Who needs them with a story this good? The movie might be a slightly basic variation of the first two (toys get lost, toys try to get back from Andy), but that doesn’t mean it’s not original. Most sequels usually lazily ripoff their predecessors. Pixar is too good for that. Not only does the story feel fresh, but so does every individual moment. That’s another rarity. For example, “Shrek 2″ tried to teach important lessons like its predecessor. Yet, they were basically the same as the original, and therefore felt nowhere near as effective. 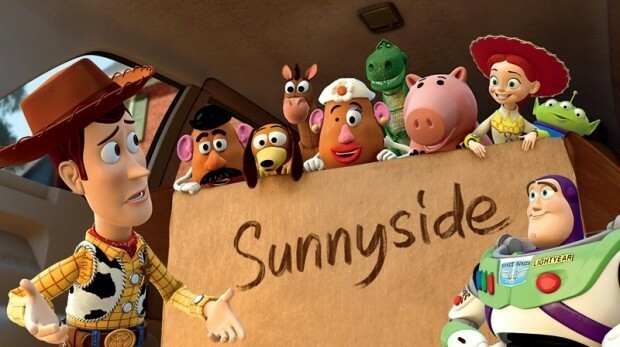 However, every little poignant moment in “Toy Story 3″ feels so new. And once again, Pixar proves it amazing ability to bring human qualities to the nonhuman. Sure, its not too hard to feel sympathetic for a fish, or even a kind rat. But making the audience care for inanimate objects is no easy task. Once again, this task is pulled off perfectly. What we see is that a toy can be just as good a friend as any person. To classify “Toy Story 3″ as a kids’ movie would be a gross inaccuracy. It is a family movie, meaning any member of a family, at any age, will get something out of this movie. Children will learn the value of friendship and commitment. They will also get an exciting story. Teens and adults might even get a more enriched experience. Some of the humor involves a keen sense of observation, and some film knowledge (spot the “Cool Hand Luke” reference). This movie should finally teach the haters that animation is not purely kiddie junk. Now, I’m going to do something I don’t normally do. Rather than discuss “Toy Story 3″ for what makes it such a great movie, I’m going to discuss what this movie means to me. The “Toy Story” series will always hold a special place in my heart, and this sequel certified it. How amazing it is that the creators coincided Andy’s life with both the beginning of mine, and my entry into adulthood. Pixar doesn’t always deal much with its human characters, but Andy’s college angst feels too familiar. “Toy Story 3″ made me want to rediscover my childhood. This also helped make every character even more meaningful to me. There is a moment toward the end, which I obviously won’t fully reveal. It was handled so maturely, and it’s so dark, that I’m shocked the studio didn’t alter it. Yet, it shows us the unbreakable friendship between the toys. After all these years, they’re still together. After all these years, I still want to be a part of their journey. As a friend lamented once the movie ended, “‘Toy Story 3′ represents the end of my childhood.”* Pixar bookmarked the start and end of my childhood. It was one of the first movies I remember seeing, and one of the last ones I’ll see before I walk down graduation isle. As the film’s conclusion showed, it’s not just about the end of one phase of life, but the beginning of a new one. And if this new beginning might also signal more time with Woody, Buzz, and the gang, then count me in. This entry was posted in 3D, Animation, Movie Review, Pixar, Sequels, Tim Allen, Tom Hanks, Toy Story, Toy Story 3 on June 18, 2010 by ian0592.